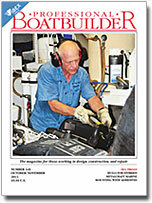 On the cover: Sea trials offer an opportunity to evaluate a vessel’s operating systems and seakeeping characteristics. The key to success is in setting clearly defined goals for the trials, planning how they will be achieved, and ensuring that the personnel who conduct them are experienced and knowledgeable in their specific areas of responsibility. Here, seasoned mechanic Gary Kepler of On-Site Diesel Repair Inc.(Cooper City, Florida) checks crankcase pressure in a hot engineroom during a sea trial aboard an 80′ (24.4m) motoryacht. Story on page 56. Photo by Steve D’Antonio. The Ording family has made a successful business of supplying wood-shell blocks to the world’s classic yachts and traditional ships. Savitsky method explained. Page 30. The Savitsky method is one of the most common ways to predict power in planing craft today. This article plots the history of the method, beginning with its origins in seaplane design, and weighs its strengths and limitations. Adhesively bonded mounts. Page 48. To limit panel penetrations and associated water intrusion, adhesives can replace screws to secure lightly loaded wiring and systems mounts. Sea trials done right. Page 56. Sea trails can reveal everything from mild flaws and weaknesses to imminent catastrophic failures aboard any powerboat, new or used. The challenge is getting the tests done right. Making sails in China. Page 66. An industrial-scale Chinese sail loft progresses from low-cost outsourcing option to true competitor in the global market for advanced sailmaking technology. Tooling at mouldCAM. Page 78. When Australia’s mouldCAM decided to enter the U.S. market, it chose a shop in Rhode Island, and an ex-professional sailor to run it. MetalCraft Marine transformed itself from a manufacturer of aluminum yachts to one of the largest suppliers of fireboats in North America. Hulls for hybrids. Page 100. A master of efficient multi- and monohull designs explores the hullforms most compatible with modern hybrid-propulsion technology. Readers comment on best practices for impact exposure testing; efficiency of the E Fusion electric outboard; and the dangers of non-compete agreements. Restoring and lenghtening a Hines-Farley; concept designs; Ted Hood and Veljko Kazulin remembered; new workboats from Alnmaritec; composite LPG tank recall; and a smart battery combiner. Recently released software is designed to greatly improve the reliability of analysis of vertical accelerations reported by sea-trials and towing-tank researchers. A naval architect’s take on a recent U.S. Supreme Court decision that clarifies when a floating home is not a houseboat.